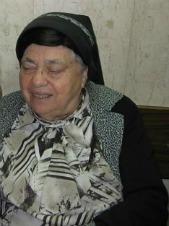 -After a neighbor named Rachel Nadel who was a mother of many children passed away, for years Rebbetzin Kanyevsky would prepare the Nadel children’s lunches every morning for school, cook for the family, attend the Nadel girls’ parent-teacher conferences, and even sometimes clean their apartment. And over the years, the Rebbetzin happily cared for quite a few other children as well who were orphaned or whose mothers were sick (in fact, she actually adopted 2 such children and raised them as her own in addition to her own 8 children.) And she did all this with a feeling of joy over the mitzvah she was doing, and without ever losing her cool. -For many years, the Kanyevskies were one of the last families managing in the famously brutal and humid Bnei Brak heat without an air conditioner. Why? Because Rebbetzin Kanyevsky didn’t want people who visited her to feel pressure to purchase an air conditioner, because “Even the Kanyevskies have one.” Rebbetzin Kanyevsky finally bought an air conditioner when someone told her that her personal assistant was suffering from the heat in the Kanyevsky kitchen. But for herself, she would have happily continued sweating and suffering. The same was true regarding purchasing an oven. For decades, Rebbetzin Kanyevsky would bring her unbaked challahs to a local bakery in order to bake them there, lest another woman would feel pressure to buy an oven. But in a way, I think that out of all the amazing stories in this book, the ones that gave me the clearest sense of the Rebbetzin’s greatness are the stories of the two times when Rebbetzin Kanyevsky DID lose her cool…. And here they are…This is an excerpt from Rebbetzin Kanvesky: A Legendary Mother to All. The Rebbetzin became really upset twice. She hugged Binah and brought her into her bedroom, where she spent a long time talking with her. Weeping, the Rebbetzin said, “It must be so hard to deal with people making fun of you when you stutter. I’m so sorry that you were embarrassed in my home!” She then contacted various doctors to find out who would be qualified to help Binah correct her speech impediment. There was another occasion on which the Rebbetzin really lost her composure. One summer morning, a group of secular Israeli girls came to daven at the sunrise minyan in the Lederman Shul and to speak with the Rebbetzin after davening. One of the girls was dressed in a completely immodest fashion and was walking the Rebbetzin home after davening. A yeshiva student from one of the nearby yeshivos noticed the girl’s inappropriate attire and began screaming at the girl and insulting her. “Shame on you! Go back to Tel Aviv where you belong! How dare you come to Bnei Brak dressed like this?” he heckled. Meanwhile the Rebbetzin hugged and comforted the secular girl. The Rebbetzin was so distraught by what happened that she…began crying hysterically to her husband. “Is it possible that I did a sin which caused this overzealous yeshiva student to act this way in front of me?” she sobbed. After spending nearly 5 minutes weeping in front of R. Chaim, the Rebbetzin sat down on her bed and took anti-anxiety medication to calm down. For the rest of the day she remained upset that someone who came to her for chizuk had been so insulted. Reproduced from “Rebbetzin Kanyevsky, by Mr. and Mrs. Naftali Weinberger, and Nina Indig,” with permission of the copyright holders, ArtScroll / Mesorah Publications, Ltd.
Wow! Amazing stories. I had heard the one about he yeshiva bauchur from someone, but had not seen it “inside”. Thanks. Usually, the term “Lost her cool” is used to indicate that the person lost CONTROL, & responded emotionally without rational mediation. And it also usually indicates unbecoming yelling and screaming. So I find it hard to believe that this term ever applied to the Rebbetzin, even in the two stories quoted. To the contrary, knowing her great self-discipline, working on herself continuously all the years, she made a CHOICE of response out of a rational reasoning, that this was most appropriate under the UNUSUAL circumstances. But the response was unusual for her, bec. she was always always** smiling and soft-spoken, no matter how difficult the person or the situation in front of her was. **always smiling, except when the situation NEEDED a different presentation!!! She may not have been “cool” at that moment, but not bec. she “lost” it [her coolness] but rather CHOSE a different, more appropriate approach to the situation…Life should be about making choices, not about flying on automatic pilot and certainly not about knee-jerk reflex actions. We have to develop varied life skills for different situations & learn which tool is best in each situation. I agree, I think saying she had 2 challenging nisyonot where she had to be az knamer, would better suit the rebbetzens demeanor. I understand your hesitation. This, though, was actually the title of this section in the biography “Losing Her Cool.” And I felt that if artscroll was saying it, then their editors know what they are doing. Actually, Frieda, I disagree. “Losing your cool” only means losing control in the sense that you’ve lost control of your temper. It is not actually used to mean losing control in general. Someone’s “cool” is their calm mien. You can lose your temper without losing a control. And the stories about the Rebbetzin show a perfect example of this. I think the chapter was very aptly named. Here is proof positive that what we have felt intuitively to be very wrong is definitely wrong, and creates a converse effect (worse yet – a total chillul Hashem); namely, verbally or physically attacking young girls or women on street corners or on buses and so forth, for not meeting someone’s highfalutin (and definitely not universally accepted) frumkeit or tzniut standards. My son-in-law, a very frum, chassidish young man with a heart of gold and a lot of ahavat Yisroel, goes out of his way to stop and wish secular Yidden a warm and hearty “Shabbat Shalom” as he walks the street. He explained, “You can get a lot further with a loving ‘Good Shabbos’ than by hurling invectives and stones at desecrators, and hollering “Shaaaabbbosss!” I am not alone in feeling the pain of the effects of these practices. Some laugh it off. As for me, I pray such people wake up and have a huge change of heart. Of course this is probably only going to come about if there is firm directive from people in leadership positions (read that Rabbanim and Admorim). When oh when will this happen!? thanks for sharing…I can’t wait to read the book! talking about here! No one is more tznius, precious and beautiful in my eyes!